Syrian President Bashar al-Assad appeared on American television talking about the cost of giving up chemical weapons. This was seen as a sign that he is ready to make compromises which continued to put the energy complex at ease. Moreover, reports that Libyan oil output is on the rise added extra downside pressure to US crude oil prices, which lost $1.67 to $105.72. A quiet day for the EUR/USD pair translated into the precious metal market, with gold ending unchanged around $1,365. It remains to be seen whether the Fed's inaction will push gold prices further up or whether we will soon see a resumption of the downtrend. The rise in the WTI crude prices was triggered by the weekly oil inventories report which showed a fall in stockpiles to the lowest level since March 2012. Nevertheless, the $1.92 climb in oil prices to $107.42 was also offered decent support by the Fed's decision to maintain the status quo. Gold bugs had their day in the sun as the precious metal rebounded $55 to $1,364.9 after dropping below the $1,300 mark in early trading. The catalyst was undoubtedly the rush for wealth preservation that came on the news that the QE taps will stay on in the US, with the tumbling US dollar also providing support. 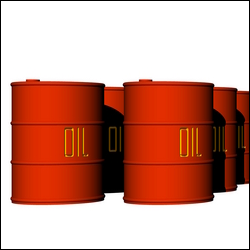 WTI crude prices kept on tumbling for the third straight session, losing $1.08 to $104.72 a barrel. Energy investors saw little reason to continue paying the conflict risk premium once it appeared that Syria might be forced to disarm. Additionally, the Libyan government is on track to solve a dispute with striking oil workers which should ease some concerns of crude supply disruptions. US inflation continues to remain in check, as shown by yesterday's Labor Department report, which spurred further problems for gold investors. Although the precious metal lost just $2.3 on the news, finishing the day at $1,309.8, it threw in the towel overnight and has crossed below the $1,300 mark at the time of writing. The weekend's Geneva agreement between the US and Russia to eliminate Syria's chemical weapons continues to put energy investors at ease as the risk of oil disruptions has now faltered. In addition, two oil fields in Libya have resumed activity. As a result, US crude oil prices not only opened lower but lost $1.31 in intraday trading, closing at $106.13 per barrel. The risk of military intervention in Syria seems to have been reduced so gold investors saw less of an incentive to look for a turmoil hedge. Thus, they continued to exit the precious metal, sending its price plunging again, down $20.1 to $1,313.8 for the day. Another retest of the support around the $1,300 level seems to be back on the cards. Reports of 'constructive negotiations' on Syria between Secretary of State John Kerry and the Russian Foreign Minister alleviated some of the concerns in the energy complex. As a consequence, investors put downward pressure on the WTI crude prices which finished $0.14 lower to $108.46 per barrel. The US and Russia have now reached a deal on Syria's chemical weapons by demanding that President al-Assad provide his inventory within a week and destroy them by mid-2014. Initially, gold spread betting prices moved lower but they found good support just above the $1,300 mark. The additional bargain hunters helped pushed its price back up later on with the precious metal even posting a small gain of $2.2 to $1,323.7 for the day. Nevertheless, the trend seems to have resumed its downside trajectory after rebounding since early July.